My Printer A is a high-tech portable mini printer. It is ultra-light and compact, with large paper roll (30mm diameter). High printing capacity thanks to its 5 batteries: approximately 10mt of printed paper! USB Interface or RS232 with special cable as optional. It comes with paper end sensor, supports an upgradable customer logo and prints the most used barcodes . Auto-installing drivers: Windows XP, Vista 7(+64bit support), Linux C.U.P.S. (32/64 bit), Android. 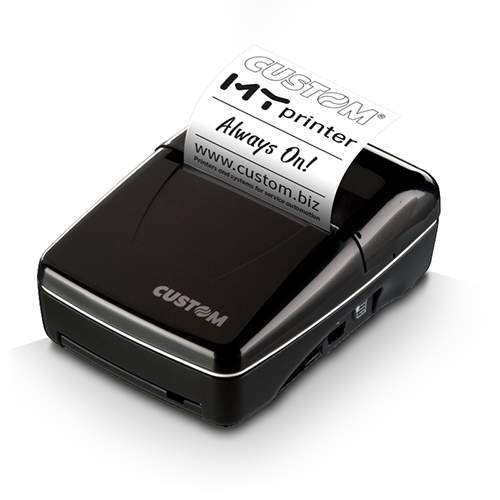 Thanks to the Bluetooth® technology, My Printer A can print from Android, iOS and WP8 cell phones. Practical belt hook, battery charger and USB cable included in the package. Ultra-light and compact: only 205g! Recharge cycle: 5 hours max.